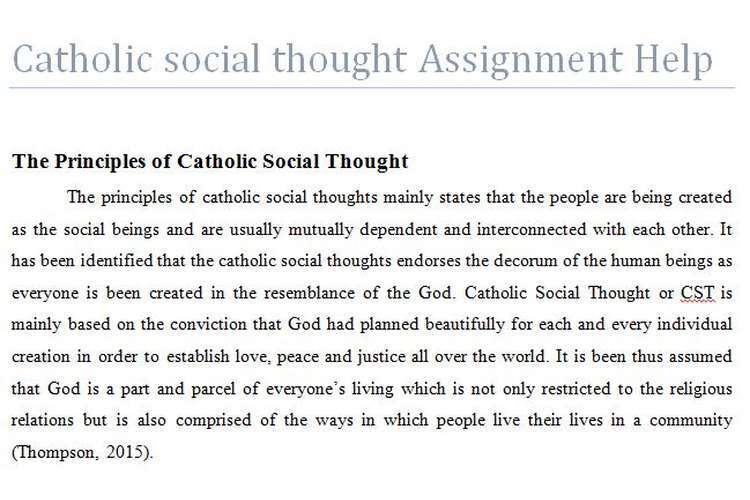 The principles of catholic social thoughts mainly states that the people are being created as the social beings and are usually mutually dependent and interconnected with each other. It has been identified that the catholic social thoughts endorses the decorum of the human beings as everyone is been created in the resemblance of the God. Catholic Social Thought or CST is mainly based on the conviction that God had planned beautifully for each and every individual creation in order to establish love, peace and justice all over the world. It is been thus assumed that God is a part and parcel of everyone’s living which is not only restricted to the religious relations but is also comprised of the ways in which people live their lives in a community (Thompson, 2015). In-spite of the emergence of the modern culture of intense egoism, the principles assumes that the people are still social and sanctified. It has been seen that the social structure and potentials are impacted with the political and economic models. The capabilities and self-respect of the individual for growing in community must be sanctioned by sharing the common goods as the enhancement of the religious and the sequential goods which are the rights of the people individually in the community. Human dignity mainly indicates the sense of being appreciated, pleased and valuable for the emotional and physical authenticity and empowerment (Tablan, 2015). It is the base of visualization of the moral society and subjected to the birth of every individual for assigning the principle values. However, the dignity of the individual must not be restrained respectively as it would be reduce the humanity itself. The basic concept behind this principle indicates the individual’s right on accessing the goods and materials with the purpose of the continued existence. The goods of world and the rights related to them are been provided only for the growth of the mankind and meet the standards of the principle. This principle of Catholic Social thought bridge the gap among the affected communities and the decision makers. Subsidiarity is been considered to be important for resolving the uncontrollable issues at the local establishments in the community in order to made social and immediate decision for all (Miller, 2015). The principle promotion and peace includes mainly three components for execution of peace i.e. justice, individual commitments and the human dignity for the common goods. However, each time these interdependent components are been compromised the peace is been settled. It is the recognition of the humanity for the dependence and origination on the earth and indicates the responsibility of the individual. It also includes the roles of human being in order to develop the surrounding environment. As per this principle, the human beings are treated as the caretakers rather than a proprietor of the environment of the creation. This principle is been mainly derived out of the subsidiaries which prioritizes the rights of human beings and the liabilities to contribute in the political, cultural, social and political in which the individuals survives (Stabile, 2015). This particular principle of Catholic Social thoughts underlines the individual liabilities towards the others without taking into account about the limits of nationality, origin, race and other aspects. The global solidarity makes use of the thoughts of being responsible for the most important member for the common goods. It basically focuses on the roles and responsibilities of the Christian Charity to the Catholic social thoughts providing a preference of eradicating the obstacles for the people living under poverty. It is very important to improve the growth of poor people of the community as it is similar to serve the whole community (Massaro, 2015). The interrelationship between individual and community is explained in CST principles with the concept that the relationship is common for every place in world. Ubuntu is an African term which includes the brief about to being in a same community as the word explains itself for an individual as- “I am what I am because of who we all are”. The meaning is quite simple to answer the reasons to be in a community for equal and collaborative culture (Massaro, 2015). Prosperous defines the completeness of individual’s psychological, social, emotional and spiritual requirements in the community. Individual’s family and friend relationships, employment to bear expenditures and opportunities of growth are also the subjects of prosperous or flourishing. More clearly, prosperous is the virtue of life for individual as it is intermediate state between deficiency and excess in goods. Self balance of goods according to activities and behavior in life is defined as virtue. Also prosperous means to being justice and satisfy, restraint and curious for the existence of life and flourishing. Individual’s temporary happiness is not same as the prosperous behavior as it means to be noble and satisfy with own activities (Thompson, 2015). Flourishing self is somehow enhancement in the flourishing of whole community because it is made up of contribution given by individual. Our common practices for human dignity and prosperous make the relationship strong between individual and community. Human being is social animal and afraid of self to being separate from community. The behavior of individual to become social included the community concept in life. Individual cannot be served with prosperous and dignity if the community is not protected to being equal and transparent for them or vice versa (Cornuel.et.al.2010). Both are in existence with the support to each other. Nine principles indirectly enforce the individual to be in community for own and others. Flourishing of entire human community is integral part of relationship. Principles emphasize a moral framework to accomplish the essentials for every member of community so that they can survive and grow easily along with the presentation of uniqueness and unionism of community. Individual participation plays an important role to for unified behavior and structure of community (Finn, 2010). CST principle solutions define the basics to move on community with the equal care and well being of individual. Without the honest and proper integration of self into community, it is not possible to create a trustworthy, meaningful and collaborative community for service to human dignity and flourishing (Finn, 2010). Both the individual and community are incomplete without each other. Cornuel, E., Habisch, A. and Kletz, P., 2010. The practical wisdom of the Catholic social teachings. Journal of Management Development, 29(7/8), pp.747-754. Finn, D. ed., 2010. The true wealth of nations: Catholic social thought and economic life. Oxford University Press. Massaro, T., 2015. Living justice: Catholic social teaching in action. Rowman & Littlefield. Miller, A., 2015. Ending Extreme Poverty: The Call from Catholic Social Thought.Integritas: Advancing the Mission of Catholic Higher Education,4(3), p.1. Stabile, S.J., 2015. The Contributions of Catholic Social Thought to the Effort to Secure Just Wages for Workers. Journal of Catholic Social Thought, 12(1), pp.45-72. Tablan, F., 2015. Catholic social teachings: Toward a meaningful work.Journal of Business Ethics, 128(2), pp.291-303. Thompson, J.M., 2015. Introducing catholic social thought. Orbis Books.